The strong voiced Lorraine Rudolph only seems to have cut just this one single for the odious Huey Meaux in Houston, TX. Both sides of this Sugar Hill Studios recording repay a careful listen. "Keep Coming Back For More" is a tuneful uptempo number whose popularity with the Northern dancers has pushed the price of the 45 upwards in recent times. But as usual I prefer the ballad After All I've Been Through For You on which Lorraine wails and screams her frustration and rage. Producers/writer Garfield Williams and Leroy Tuna place her in a big city cry ballad style arrangement rather than a more typical southern soul one but to be fair to them it suits her voice admirably. My friend Barry Martin has remarked on the vocal similarities of her voice with that of Lorraine Randolph - as well of course as the near identical names. I'm not convinced they are one and the same. Can anybody offer some proof one way or the other? UPDATE ~ Andrew has kindly been in touch to say that he has seen the tape box for this 45 and it has a 1972 date on it. I'm grateful to him for this extra info. "Lorraine Rudolph sounds to me vocally identical to the 'Loe' (Lori Rudolph) of Loe & Joe on Harvey Fuqua's HARVEY 112. 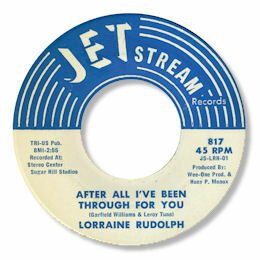 I've also heard her other 45 (as Lorri Rudolph) on TRI-PHI 1003 and I'm more convinced than ever. In spite of the ten-year gap between these two 45s and the Jet Stream disc, the similarity of name and vocals can't be a co-incidence surely?" Can anybody confirm this theory?